The villa is 170 m2 (1,830 sq ft) and consists of two equally sized levels, each with its own private entrance. The upper level includes 2 bedrooms with King size beds and a shaded wooden pergola; a single sofa bed, 2 bathrooms (one en suite), a small kitchenette, as well as an elegant and bright sitting room with access to a second sea view veranda. It also features LCD TVs with satellite channels in both bedrooms, a wireless high speed internet connection, individually controlled air conditioning throughout and bedroom safe deposit boxes. The pool level includes one bedroom with King size bed, 2 single sofa beds, 2 bathrooms (one en suite), a shaded wooden pergola, a fully-fledged kitchen, as well as a light living area along with a dining table with seating for 10. It also features a cinema wide LCD TV with satellite channels in the living room and an additional LCD TV in the bedroom, both with satellite channels, a wireless high speed internet connection, individually controlled air conditioning throughout and a bedroom safe deposit box.The villa commands unparalleled views of Parikias picturesque bay as well as of the sacred island of Delos. 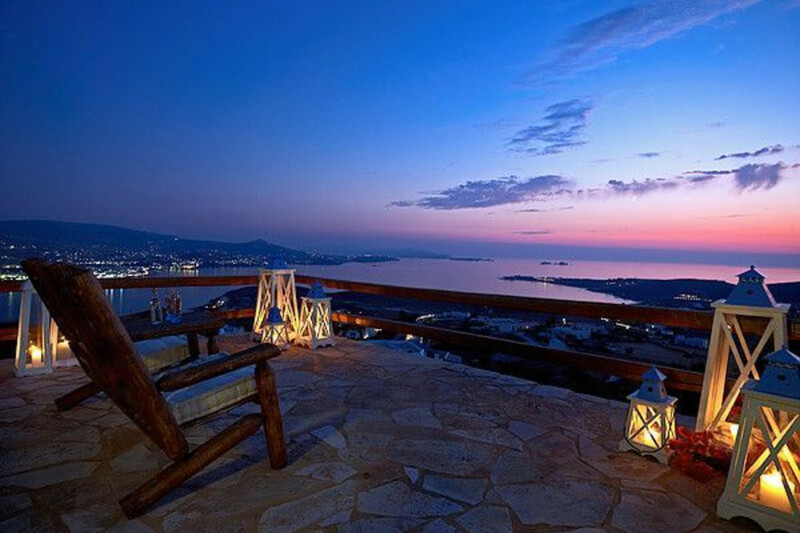 Of equal importance, its south-western orientation translates into some of the most spectacular sunsets in Greece.Designed by award-winning architects, throughout the villa, attention to detail and handmade Cycladic furniture ensure a unique staying experience. The villa has a private 16m x 8m overflow swimming pool. It is equipped with ultra-modern chlorine-free water treatment; there is also a pool house with shower and WC.Nestled next to the swimming pool is a delightful, fully equipped bar, where you may enjoy thirst quenching drinks or your favourite cocktails while sunbathing or relaxing to streams of soft music during the sunset hours.At the Pool side there are two covered pergola seating areas and sun loungers. Private dining is offered within the villa's spacious living room or at either pergolas near the pool.